The baby girl had been washed five metres down a stormwater drain in Durban, and has since been stabilised. Rescue Care Paramedics together with Metro Search and Rescue and the Ethekwini Fire Department are currently on scene on Barracuda Drive in Newlands East. Where a new born baby is stuck down a storm water drain. Rescue workers are busy trying to get to the baby at the moment. Picture: Rescue Care. 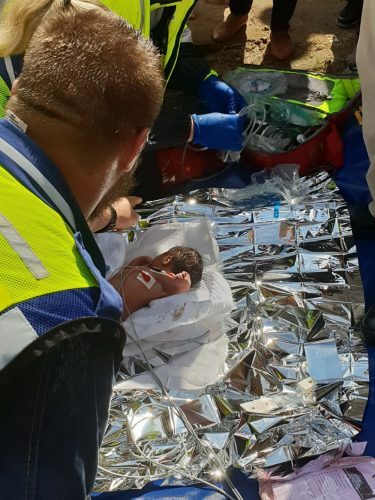 NATIONAL NEWS & VIDEO - The newborn baby who was trapped in a stormwater drain in Newlands East, Durban has been rescued and is a stable condition, reports Berea Mail. Rescue workers worked for three hours to save the baby girl, who had been washed five metres down a drain pipe. The pipe was about six centimetres in diameter. Passersby are believed to have heard the baby’s cries and alerted authorities on Monday morning. 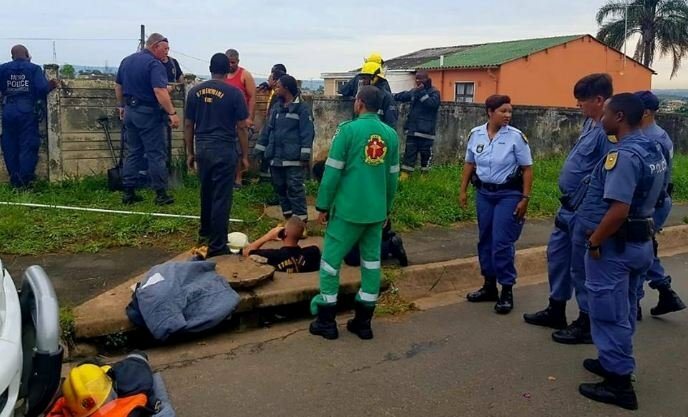 Rising Sun Overport reports that Rescue Care paramedics together with Metro Search and Rescue and the eThekwini Fire Department worked fervently on the corner of Barracuda Road and Herring Circle in Newlands East to rescue the infant. “Rescue workers are busy trying to get to the baby at the moment,” said Rescue Care’s operations director, Garrith Jamieson. “The Fire Department has seen the baby moving and they are trying to get to the baby. A helicopter is inbound to transport the baby to a nearby hospital as soon as possible,” said Jamieson.